Air pollution puts strain on the skin and accelerates the natural aging process. Made with valuable Healing Earth, the capillary suction power of this mask absorbs both fine particles and pollutants and provides relief for the skin. The special formula of sea fennel, green tea and vitamin E, helps this mask to neutralise free radicals and, with regular use, it helps prevent premature aging of the skin through oxidative stress. Supplemented with aloe vera, olive oil and amaranth oil, the nourishing complex supports the regeneration of contaminated skin, strengthens the lipid mantle and helps the skin retain moisture. For a deeply cleansed skin with luminous radiance! 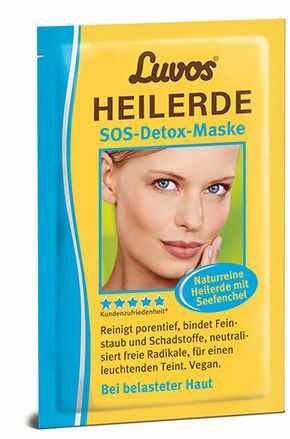 Ingredients: Aqua, Sorbitol, Helianthus Annuus (Sunflower) Seed Oil1, Alcohol, Glycerin, Glyceryl Stearate Citrate, Loess, Cetearyl Alcohol, Glyceryl Stearate, Tocopheryl Acetate, Olea Europaea (Olive) Fruit Oil, Camellia Sinensis Leaf Extract1, Amaranthus Caudatus Seed Extract, Aloe Barbadensis Leaf Juice Powder, Crithmum Maritimum Extract, Maltodextrin, Magnesium Aluminum Silicate, Xanthan Gum, Stearic Acid, Palmitic Acid, Caprylic/Capric Triglyceride, Tocopherol, Sodium Hydroxide, Levulinic Acid, Sodium Levulinate, Parfum (Natural Essential Oils), Limonene2, Linalool2, Citral2, Geraniol2, Eugenol2, CI 77891 (Titanium Dioxide), CI 77492 (Iron Hydroxides), CI 77499 (Iron Oxides), CI 77491 (Iron Oxides).